The range of gaging probes we propose is wide and complete. - Inductive probes (analogue) : Half bridge with Tesa compatibility. Each of these technologies allows to be adapted to the user's needs in terms of stroke, precision, linearity. The digital probe brings important improvements with regards to the existing technologies. The digital probe consists of the probe itself and of its electronic head. 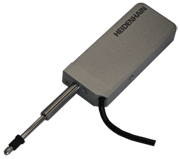 Metro is a reseller of the Heidenhain and Magnescale probes. Theses probes are perfectly adapted to be used with our displays. Linear encoders are highly accurate optical gauges designed for use in application where accuracy is required along the whole measurement range. Block gauges are primarly motion changers or mechanical interfaces that sit between the component and the measuring sensor. It is adapted to application where a standard pencil probe would not fit. The block gauges are available in 2 versions. The first is fitted with precision linear bearings, the motion of the second is ensured by flexures without sliding parts that give an extrem life duration without degradation of performance.